Previous image, 22 total items. Next image, 22 total items. One of the greatest art galleries in Genoa is housed in a wonderful palace with a collection of Genoese, Italian and European paintings. The White Palace (Palazzo Bianco) is one of the main buildings in the center of Genoa. Discover a beautiful landmark that together with the Red Palace (Palazzo Rosso) and Palazzo Doria Tursi, form part of a very important cluster of museums in the city. This famous palace was built between 1530 and 1540 by Luca Grimaldi, a member of one of the most important Genoese families. In 1658 the palace passed into the possession of the De Franchi family, and in 1711 it was given by Federico De Franchi to Maria Durazzo Brignole-Sale, his main creditor. Between 1716 and 1717 the Palazzo Bianco was restored and earned the name White Palace for the color of its exterior decoration. Visit the palace to learn about Genoan history through different types of elegant artworks, from beautiful paintings to musical instruments of the time. The Gallery of the White Palace has impressive masterpieces by renowned Italian artists. It also features numerous paintings from other European painters from the 12th to the 17th century. Wander along the elegant corridors to see French, Spanish, Dutch and Flemish works of art. See some of the most important pieces of the palazzo collection, such as Ecce Homo by the Italian master Caravaggio. The scene of the famous painting shows Pontius Pilate displaying Christ to the crowd with the words Ecce homo! (Behold the man). Enjoy the art of Jusepe de Ribera, a leading painter of the Spanish school, and Peter Paul Rubens, considered the most influential artist of Flemish Baroque tradition. Learn about the activity of the Genoese painters of the 17th and 18th centuries, such as Giovanni Benedetto Castiglione, Giovanni Andrea Ansaldo and Bernardo Strozzi. While you are at the White Palace, make sure you see its interesting display of 18th-century clothing and its small but pretty gardens. Take some photos of the elegant green area and enjoy a rest surrounded by beautiful plants. Find the Palazzo Bianco in Via Garibaldi, one of the most famous streets in Genoa. Discover the weird and wonderful creatures of the deep at one of Europe’s largest aquariums, where sharks, manatees, penguins and a myriad of tropical fish await. Venture into this thriving and culturally rich area of Genoa to discover splendid museums, a bustling harbor and a leisurely atmosphere. Stroll past the quaint shops and cafés that line the narrow alleys leading to Genoa’s main square then visit the historic buildings surrounding it. Watch a choral concert, an orchestral recital or a dramatic performance with an ornamental street backdrop in the main theater of this historic complex. Inspect the fabulous frescoes and chandeliers and climb the tower to see the former secret jail that detained renowned inmates. When you take a ride in this lift you’ll see spectacular aerial views of Genoa and experience the expertise of an internationally famous Italian architect and engineer. Be impressed at the grandeur and history of Genoa’s most prominent religious building, where you’ll find legends, art and even a relic believed to be from the Last Supper. Inside this beautiful religious construction in Genoa are exquisite artworks commissioned by some of the most significant noble families of the city. Discover the grandeur and beauty of one of Genoa’s most opulent medieval mansions. Be impressed by the colorful façade and changing exhibitions. Immerse yourself in the opulence of the Baroque church and lavish palace and learn about jazz in the museum on this expansive plaza. A spectacular display of paintings, sculptures, elegant frescoes and stuccoes lies within this large and important palace from the 17th century. Enter this beautiful and fascinating museum to discover the cathedral’s most precious artifacts and learn more about its long history. Check out the stunning frescoes decorating the majestic rooms of this palace as well as the works of art in the gallery. Set eyes upon Genoa’s most famous historic figure at this grand monument commemorating the great explorer and the city’s long maritime heritage. An important symbol of Genoa’s past, these magnificent defensive gates, marked by storybook twin towers, once protected the city from attacks and plundering. 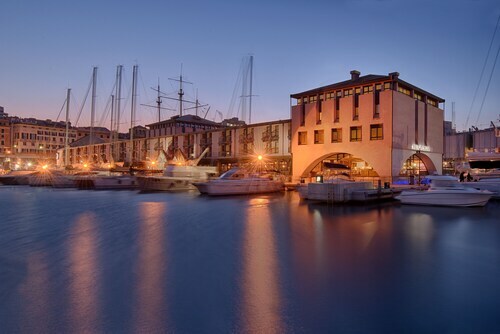 Visit the largest sea museum in the Mediterranean and learn about Genoa’s long maritime history, as well as its most famous seafarer, Christopher Columbus. Travel back in time to the prosperous days of the 16th century as you step inside one of Genoa’s grandest palaces. Make your way through Genoa’s old town area, through the maze of medieval streets, to find a beautiful little square that once belonged to a powerful Genoese dynasty. Wander along one of Genoa’s most famous streets, located in a historic part of the city full of impressive architectural treasures. Step into the opulent world of one of Genoa’s regal palaces and find a fascinating museum dedicated to the world-famous violinist Paganini. Enter the charming rooms of this stone building to learn about the Genoa native who first led Europeans to the Americas. Medieval sculptures and paintings from the region of Liguria grace the halls of an ecclesiastical complex containing Genoa’s last remaining Gothic church. Stand in awe of giant tree ferns, meet iguanas and turtles and inspect plants that produce cotton and chewing gum in this see-through ball. Marvel at the shiny gold leaf décor and stunning art pieces adorning the magnificent interior of this domed 16th-century church. Study the art canvas by Rubens, enjoy the mesmerizing opulence of the nave and note the influence of the Jesuits at this elegant church. Get a different perspective of Genoa from this famous spot where you can enjoy stunning views across the city with the beautiful harbor as a backdrop. Located in Genoa Historical Centre, this hotel is within a 15-minute walk of Piazza de Ferrari, Aquarium of Genoa and Old Port. Genoa Port Center and San Martino Polyclinic Hospital are also within 3 miles (5 km). Genoa Genova Brignole Station is 11 minutes by foot and Genoa Piazza Principe Station is 22 minutes. 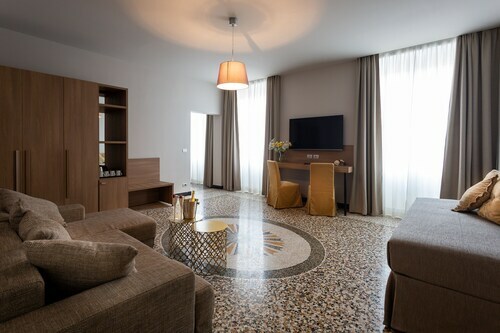 This family-friendly Genoa hotel is located near the airport, within a 15-minute walk of Piazza Principe and Old Port. Aquarium of Genoa and Genoa Port Center are also within 1 mile (2 km). Genoa Piazza Principe Station is only a 2-minute walk and Genoa Via di Francia Station is 28 minutes. Situated in Genoa, this property is within a 15-minute walk of Piazza Principe and Old Port. Aquarium of Genoa and Genoa Port Center are also within 1 mile (2 km). Genoa Piazza Principe Station is only a 2-minute walk and Genoa Via di Francia Station is 27 minutes. Located in Genoa Historical Centre, this hotel is within a 10-minute walk of Palazzo di San Giorgio, Aquarium of Genoa and Genoa Port Center. Old Port and San Martino Polyclinic Hospital are also within 3 miles (5 km). Genoa Piazza Principe Station is 12 minutes by foot and Genoa Genova Brignole Station is 22 minutes. Located in the heart of Genoa, this hotel is within a 5-minute walk of Aquarium of Genoa and Old Port. Genoa Port Center and San Martino Polyclinic Hospital are also within 3 miles (5 km). Genoa Piazza Principe Station is 19 minutes by foot and Genoa Genova Brignole Station is 28 minutes. 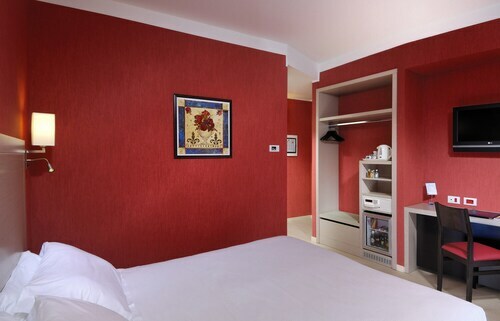 Situated in Genoa, this hotel is within a 15-minute walk of Piazza Principe, Aquarium of Genoa and Old Port. Genoa Port Center and San Martino Polyclinic Hospital are also within 3 miles (5 km). Genoa Piazza Principe Station is only a 2-minute walk and Genoa Via di Francia Station is 28 minutes. Located in Genoa Historical Centre, this hotel is within a 15-minute walk of Piazza Principe, Aquarium of Genoa and Old Port. Genoa Port Center and San Martino Polyclinic Hospital are also within 3 miles (5 km). Genoa Piazza Principe Station is only a 2-minute walk and Genoa Via di Francia Station is 29 minutes. 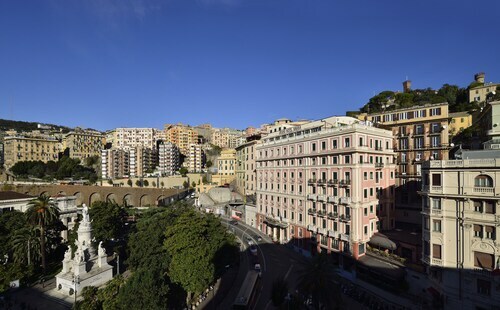 Located in the heart of Genoa, this hotel is 0.7 mi (1.2 km) from Royal Palace. Genoa Genova Brignole Station is 11 minutes by foot and Genoa Piazza Principe Station is 22 minutes.